This colorful, life-size models includes 19 dissected or dissectible structures and 10 detachable parts. 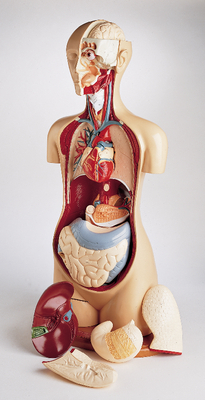 The eyeball, half of the brain, left and right lung halves, liver and gallbladder with diaphragm, stomach, small and large intestine, and head are all removable for hands-on study. Rigidly mounted on a hardwood base, the model also includes a guide. Size: 94 cm H.